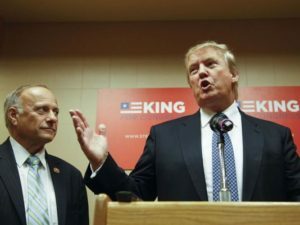 President Donald Trump is reviving an old chestnut of the racist white nationalists and nativists led by Rep. Steve King (R-IA) – ending birthright citizenship in the U.S.
“Birthright” citizenship is contained in the 14th Amendment, Section 1. It is not a “policy,” it is a constitutional right. If Steve “cantaloupe calves” King wants to change this, it will require a constitutional amendment. But his bill is proceeding on the assumption that he can nullify this constitutional provision by a simple legislative act. The right-wing National Journal even goes so far as to suggest that the “next president” (presumably a Republican) could do this by an executive order. This is how unhinged the leaders of the Mass Deportation Party are. Mr. Trump’s plan met with swift pushback from some even in his own party on Tuesday. House Speaker Paul D. Ryan of Wisconsin, who is retiring, said in an interview that the president “obviously” cannot eviscerate birthright citizenship by executive order. The Citizenship Clause of the 14th Amendment provided a broad definition of citizenship that overruled the decision of Dred Scott v. Sandford (1857) which held that African Americans were not and could not become citizens of the United States or enjoy any of the privileges and immunities of citizenship. While the 14th Amendment was primarily intended to overrule Dred Scott and make sure that freed slaves and their children were granted U.S. citizenship, it was not limited to freed slaves. Congressional debate of the Citizenship Clause included lengthy debate over Native Americans, Chinese immigrants in California, and Gypsies. The Citizenship Clause has been interpreted by the U.S. Supreme Court to mean that children born on United States soil, with very few exceptions, are U.S. citizens. This type of guarantee — legally termed jus soli, or “right of the territory,” as opposed to jus sanguinis, or “right of blood,” previously existed under English common law. The Supreme Court ruled in U.S. v. Wong Kim Ark (1898) that “where birth in the United States was clear, a child of Chinese parents was, in the Court’s opinion, definitely a citizen under the Fourteenth Amendment, even though Chinese aliens were ineligible to naturalize under then-existing law.” (Chinese Exclusion Act). Mr. HOWARD: This amendment which I have offered is simply declaratory of what I regard as the law of the land already, that every person born within the limits of the United States, and subject to their jurisdiction, is by virtue of natural law and national law a citizen of the United States. This will not, of course, include persons born in the United States who are foreigners, aliens, who belong to the families of ambassadors or foreign ministers accredited to the Government of the United States, but will include every other class of persons.It settles the great question of citizenship and removes all doubt as to what persons are or are not citizens of the United States. Opponents of birthright ciizenship claim Sen. Howard intended two separate classes of persons: foreigners and aliens; and children of ambassadors and foreign ministers. But nothing in the Congressional Record of debate of the Citizenship Clause supports this fictitious claim. Repeal proponents contend that history supports their position. First, they quote Howard’s introductory remarks to state that birthright citizenship “will not, of course, include … foreigners.” But that reads Howard’s reference to “aliens, who belong to the families of ambassadors or foreign ministers” out of the sentence. It also renders completely meaningless the subsequent dialogue between Senators Cowan and Conness over the wisdom of extending birthright citizenship to the children of Chinese immigrants and Gypsies. See, Fox promotes false claim that 14th Amendment was not meant to apply to children of immigrants | Media Matters for America. Rep. Steve King and Arizona’s shadow governor, state Senator Russell Pearce, are pursuing legal fictions by anti-immigrant organizations that they can simply legislate restrictive language into the broadly defined Citizenship Clause of the 14th Amendment. Their disingenuous arguments are legally incorrect. The only way to amend the Citizenship Clause of the 14th Amendment is by a constitutional amendment. It would have to be approved by Congress and ratified by 38 state legislatures. This is not even remotely a possibility. Mike Pence is wrong, as usual. The Supreme Court ruled in U.S. v. Wong Kim Ark (1898) that “where birth in the United States was clear, a child of Chinese parents was, in the Court’s opinion, definitely a citizen under the Fourteenth Amendment” (see above). The only conceivable reason for doing this is that the five conservative activist justices on the U.S. Supreme Court will ignore the congressional history of the 14th Amendment and overturn long-standing Supreme Court precedent. Oh wait, this is exactly what conservative activist justices do. GOP authoritarianism has corrupted the Supreme Court as much as it has our politics. Admit it. Republicans have broken politics. You have been warned.